We expected Fable Legends, Lionhead's free-to-play continuation of its long-running Fable RPG series, to be out sometime before the end of this year. As anyone who's been keeping a keen eye on their Advent calendar will have already come to suspect, that's not going to happen. The studio announced today that the game has grown a whole lot bigger than expected, and so for now it's going to stay in closed beta. "Fable Legends is coming together well and it’s a lot of fun. But we think that we can make it even better. So we’ve decided to extend our closed beta to continue to listen to feedback from our players and add features and polish that will make a real difference. 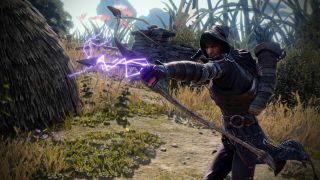 This means Fable Legends won’t release into open beta this holiday as previously announced," Lionhead said in a message posted to FableLegends.com. "To be honest, we didn’t anticipate just how big Fable Legends is becoming. It’s simply the most ambitious game we’ve ever created at Lionhead. We’ve built a unique and innovative multiplayer experience combining RPG and RTS gameplay which allows you to play, and use your gear seamlessly, across Xbox One and Windows 10. On top of this, we’ve built a beautiful new world full of grand stories and adventures. And it’s taking more time than we thought." The plan now is to bring in 100,000 new players to the closed beta that's currently underway, and then go to open beta sometime in the spring of 2016. Closed beta signups are being taken at the Fable Legends website, but Lionhead warned that access priority will be given to those who've been waiting the longest to get in. A full and proper launch date remains up in the air.